This past week, we welcomed 'home' Chris & Rebecca and their daughter, Gabrielle. Three years ago, they spent 10 months here hosting teams and teaching English. 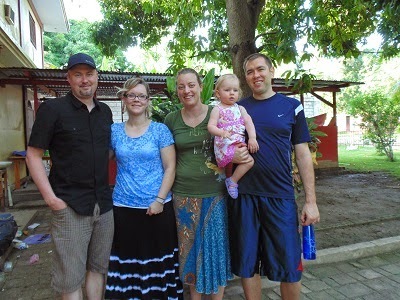 This is the first time they have been back together and their daughter's first trip to Haiti! Chris is now the Youth Pastor for the Innisfail Alliance Church (Alberta) and they were able to bring a couple from their church with them -- Jon & Jen. Rebecca oversees the child sponsorship program for Haiti ARISE. She is planning on doing updates on the sponsored children and older students and finding more kids that need sponsored.